As a result our children pick themselves up when they trip over, fix (most) of their mistakes, ask for help when they need it, problem-solve well and are very rarely ‘bored’. They don’t even know that word … when we see them lost for something to do, they tell us they are ‘tired’, and so we suggest they rest with a book until they can think of something to do. My husband and I are ready with ideas, but this is pretty rare. There is always something to construct for a game: a cubby, a boat, a truck. 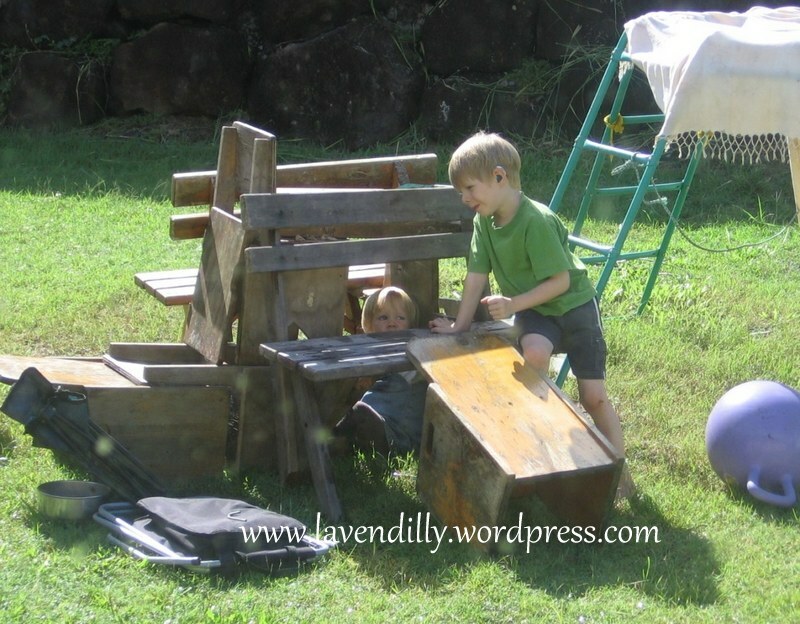 When the cubby house appeared in the backyard, our son immediately began constructing a ‘shower’ and a ‘verandah’ for it out of two planks of wood and a piece of string. Needless to say a little imagination goes a long way! I am not convinced such ideas would present themselves if I were always there next to them in their play, watching what they use and how they use it. I might not SEE everything my children do … but I do listen. At five years and 2 years old they are still too young for me to completely let go of guidance in their play, but I leave them alone as much as possible to explore the themes and ideas in their minds, and to experiment with found objects. There is a level of trust that has developed between us when they play, but I am still aware that there are some developmental limitations too. While I trust (sort of) our son with a selection of real tools, I don’t trust him to play with his sister using a plank that has nails sticking out of it. He is, however, becoming more responsible with rules and expectations of safety. So long as I am aware that their environment is safe, they can do what they like. But their play took a new direction today. This morning my two children and their friend began playing killing games. Killing monsters and animals, to be precise. I listened for a while, feeling a little uncomfortable as this is the first time that killing has entered our household as a theme in play. I’ve been poised by the window, listening and watching carefully, in two minds about whether I should respond, and if I do, how? It was a personal challenge to see how long I could let it go for before I said something. I do understand why these games arise. Particularly for boys, who seem to absorb knowledge about weapons and shooting and methods of warfare directly out of the ether of the earth – and with several parts of our world constantly in the grip of war it does not surprise me at all that there is such a detailed awareness floating around out there for the little-boy radars to pick up. Boys just don’t seem to need direct exposure in order to gain knowledge about this topic! It is out there. I’m not worried about it – I do believe it is important that children explore these themes if they arise. There are ways and means to help children learn about these topics in a way that is healing, developmentally appropriate, and actually reinforces positive values. It is a natural part of a young child’s world to explore the balance of good and evil. It is how they measure the safety, comfort and surety of their own world. You have to know what evil is in order to know how to live without it. You have to hurt yourself in order to know how it feels and how to take care of yourself next time. You have to wonder and question and explore these themes in order to give them a place, to heal a hurt, to know your enemy. Sometimes you just have to let it go and see what happens. The thing is I was a bit shocked at the venom in their voices when they were hunting and killing these monsters. It was our little 2 year old daughter I was watching closely … who absorbs everything like a sponge and then leaks it all out again in play and conversation. To see my darling little sunshine baby stalking, hunting and killing monsters as if she was born to do it was too much. I couldn’t help myself – I went out and suggested they make a monster trap so that they didn’t have to kill the monsters. They could trap them and then work out what to do with them. There was a pause while this idea was taken in – I don’t think the boys were fooled for a second about my motives … but after a moment they shrugged their shoulders and said “OK. That’s a good idea” and began finding the things they needed for their trap. So what was it that bothered me the most: the theme? the appearance of real evil? protecting my little 2-year-old magical rainbow universe? I’m not sure, but I have bought some time to think about it, and to do some reading about it, and talking about it with other parents. That’s how we learn. Perhaps I’ll let it go next time. Perhaps not. At least I am sure of the gold in my child’s heart (and his friend’s). I know that the good and the beautiful and wonderful is a big part of their world, and these themes would be just as I suggested – an exploration of an idea or an adventure. My intervention has led to a new track in their play. As I write this their monster trap (built of chairs and bits of wood, a drop sheet, 2 bicycles and a piece of rope) is now a boat and they are sailing through the jungle with the monsters trapped within. It has returned to a level of positive, constructive and imaginative play in which everyone has a role and is looking out for each other. There is problem solving, use of tools, sharing, caring and great listening and communication. I have moved away from my seat by the window and am happily eavesdropping on this Utopian world of creativity and cooperation. Would their game have naturally returned to this point of equilibrium? I’ll never know! What needs to come out will come out! I guess we are more willing to accept our children playing as animals; animals are meant to roar and chase and kill each other. Humans are not programed to do this and indeed we are influenced by other people and things we see. I know myself as a child I played many games, outside and inside, games involving people, games involving props. I do think we need to experience some of these games that may come across as vicious. We need these experiences to help deal with the harsh realities that surround us. I think it also helps to build us, to keep our eyes open to the world and become well rounded adults. I do agree to intervene if the play becomes more aggressive or nastier than children can comprehend. I would have done just as you had done, Jen. And I still do. Although, as my boys are older, the games sometimes become violent (to each other) and when this happens I step in and re-direct. It’s amazing the inner knowledge they have of weaponry and hunting! Caleb is fascinated with any kind of weapon – guns, knives, swords, bows and arrows…. It’s taken me time to be comfortable with it, and have only done so with a lot of coaching from Simon who assures me he was exactly the same as a child! Believe it or not, I actually caved the other day and let Caleb buy a cap gun with his pocket money. I was torn for days…. However the novelty wore off very quickly and it now lays broken in the back yard. He’s back to swords made from branches now and assures me he only kills evil monsters and no one else. A really interesting one to ponder, I don’t think there’s a right or wrong answer. I normally only step in when they start to get too rough with one another and definitely find they play better together when I don’t intervene regardless of what they’re playing. Hmmm, food for thought. It’s certainly taken me a while to get used to having all boys the desire for weaponry is innate and my three year old regularly tells me he has his imaginary sword, dagger, spear AND axe with him in case we meet any baddies on our way! It’s harder being grandma than I thought it would be. As a parent, I wouldn’t have made a mistake like this. But whether you are a parent or an over-enthusiastic grandparent, you can correct a slip like this without too much fall-out. So we do the best we can, don’t we?